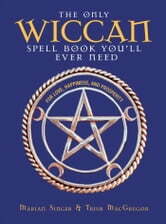 Although Wiccan magick is a craft that appears to be shrouded in mystery, The Only Wiccan Spell Book You'll Ever Need cuts out the complexities. Inside, would-be Wiccas will find the basics of tools and symbols, spellcraft fundamentals and individualized chapters that focus on specific sorts of spellcasting. Filled with plenty of examples, simple instructions and recipes that incorporate easy-to-find ingredients, this book will have novice Witches whipping up their own magick and casting spells in no time.